Installation instructions for the 2CN0002E BMS master. You MUST provide a way for the BMS to shut down the source (charger), and the load, DIRECTLY! Otherwise, your cells are NOT PROTECTED, and will not be balanced. BOTH GROUND PINS MUST BE WIRED TO THE SUPPLY! We strongly recommend that you use prewired HD harnessed from Elithion. If you choose instead to make your own harnesses, you must be able to do so with high quality assembly skills. Unfortunately, we do not have the resources to teach all of our clients proper assembly procedures, which are essential for a successful project. This connector is for low power signals. NOTE PIN NUMBERS AND TAB ORIENTATION! Control connector pin numbers and orientation. 16 GND Gnd Signal ground Use a separate wire from power ground, to avoid errors in analog readings. 20 DCL Lin out Discharge Current Limit Analog voltage: 5 V = no limit, down to 0 V = no discharging current allowed. 36 GND Gnd Signal ground Use a separate wire from power ground, to avoid errors in analog readings. 40 CCL Lin out Charge Current Limit Analog voltage: 5 V = no limit, down to 0 V = no charging current allowed. This connector is for high power signals. Power connector pin numbers and orientation. 1 FLT O.D. out Fault Open collector, polarity selectable in software. Activated in case of fault. 6 V+S Pwr in Power in from source The BMS is powered by voltage at either terminal (uses isolating diodes). V+L must be powered whenever the load is on, and only then. V+S must be powered whenever the source is on, and only then. For example, in a BEV or PHEV application, V+L is powered by Ignition, V+S is powered whenever the vehicle is plugged into AC power. In a HEV application, V+S is powered by the ignition. In a UPS application, V+S is powered whenever there's AC power, and V+L is powered all the time. If only one power source is possible, use V+S. Which input powers the BMS selects which current sensor is used. If both are powered simultaneously, the current reading may double. 8 V+ Pwr out Full voltage utility supply Voltage present when BMS powered through either V+ line. May be used to power equipment such as loggers, remote controllers. 10 HLIM O.D. out High Limit Open collector, polarity selectable in software. Activated when the most charged cell's voltage is too high. 11 PGND Gnd Power ground Use a separate wire from signal ground, to avoid errors in analog readings. 13 PGND Gnd Power ground Use a separate wire from signa ground, to avoid errors in analog readings. 14 Cont. Req. Dig in Contactor request Requests that contactors be on. For vehicle applications, connected to the Ignition line (off when ignition goes off). 15 PGND Gnd Power ground Use a separate wire from signal ground, to avoid errors in analog readings. 16 V+ Pwr out Full voltage utility supply Voltage present when BMS powered through either V+ line. May be used to power equipment such as loggers, remote controllers. Use this circuit if driving contactors from the Lithiumate HD Master. This controller has 2 separate grounds. Both of these grounds must be connected to the negative of the low voltage supply (the 12 V nominal power supply, DC-DC converter or battery that powers the BMS), each through a separate wire. These grounds are connected to each other on the BMS controller by a small resistor. The negative of the low voltage supply (which is connected to the signal and power grounds) may or may not be connected to the earth or chassis, as required by the application. In general, for safety reasons, the negative of the high voltage battery (the Li-Ion pack that is managed by this BMS) should not be connected to these grounds. Yet, if safety is not an issue, as far as the Elithion BMS is concerned, it is OK to do so. The BMS is on when there's voltage on either of these inputs. See the specifications for the allowable voltage range and the supply currents. Power to and from the HD master. See the specifications for the maximum current available from these outputs. Each of these outputs is either open (clamped to 42 V) or connected to the power ground, depending on the state they are reporting. See the specifications for the maximum sinking current and maximum open circuit voltage for these outputs. Note that the polarity (active open or active grounded) is programmable. See the programming instructions. See the specifications for their output resistance, and maximum voltage for these outputs. The control connector also has ground and 5 V outputs to power current sensors. If the application includes a CAN bus, the CAN bus lines can be connected to it. If the master is at the end of the CAN bus, terminate the bus by connecting the each CAN line to one of the TERM lines. 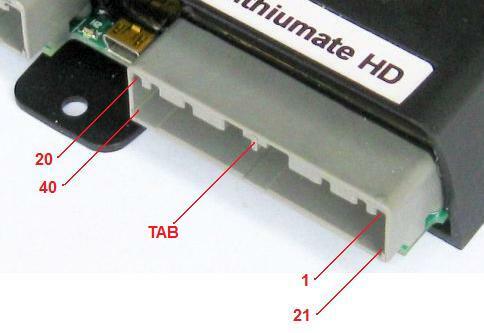 Connect a USB mini-B cable to this port and to a computer running the Lithiumate GUI application. The battery pack should be divided into between 1 and 8 banks or at least 3 cells each. A cell board is mounted on each cell. 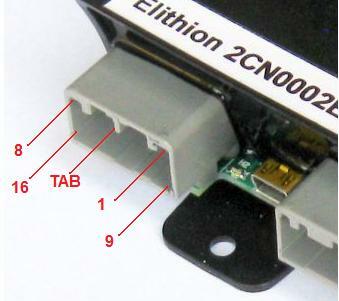 The two end boards in each bank are connected to the control connector. The Master sends data to the cell boards ("TX") and receives back data ("RX"). If you wish to make your own harnesses, you may use the compoents and tools listed below. © 2008~2019 Elithion™, LLC. All rights reserved, except where noted by CC mark. Page published on Apr 27 2016.